The micro economics is the study of an economic behavior of a particular individual, firm, or household, i.e. it studies a particular unit. On the other hand, macro economics is the study of the economy as a whole i.e., not a single unit but the combination of all, firms, households, nation, etc. ‘Economics’ is defined as the study of how the humans work together to convert limited resources into goods and services to satisfy their wants (unlimited) and how they distribute the same among themselves. Economics has been divided into two broad parts i.e. Micro Economics and Macro Economics. Here, in the given article we’ve broken down the concept and all the important differences between micro economics and macro economics, in tabular form, have a look. Meaning The branch of economics that studies the behavior of an individual consumer, firm, family is known as Microeconomics. The branch of economics that studies the behavior of the whole economy, (both national and international) is known as Macroeconomics. Scope Covers various issues like demand, supply, product pricing, factor pricing, production, consumption, economic welfare, etc. Covers various issues like, national income, general price level, distribution, employment, money etc. Importance Helpful in determining the prices of a product along with the prices of factors of production (land, labor, capital, entrepreneur etc.) within the economy. Maintains stability in the general price level and resolves the major problems of the economy like inflation, deflation, reflation, unemployment and poverty as a whole. Limitations It is based on unrealistic assumptions, i.e. In microeconomics it is assumed that there is a full employment in the society which is not at all possible. It has been analyzed that 'Fallacy of Composition' involves, which sometimes doesn't proves true because it is possible that what is true for aggregate may not be true for individuals too. Microeconomics is the branch of economics that concentrates on the behaviour and performance of the individual units, i.e. consumers, family, industry, firms. Here, the demand plays a key role in determining the quantity and the price of a product along with the price and quantity of related goods (complementary goods) and substitute products, so as to make a judicious decision regarding the allocation of scarce resources, concerning their alternative uses. Examples: Individual Demand, Price of a product, etc. Macroeconomics is the branch of economics that concentrates on the behaviour and performance of aggregate variables and those issues which affect the whole economy. It includes regional, national and international economies and covers the major areas of the economy like unemployment, poverty, general price level, GDP (Gross Domestic Product), imports and exports, economic growth, globalisation, monetary/ fiscal policy, etc. It helps in resolving the various problems of the economy, thereby enabling it to function efficiently. Examples: Aggregate Demand, National Income, etc. Microeconomics studies the particular market segment of the economy, whereas Macroeconomics studies the whole economy, that covers several market segments. Micro economics stresses on individual economic units. As against this, the focus of macro economics is on aggregate economic variables. While microeconomics is applied to operational or internal issues, environmental and external issues are the concern of macro economics. 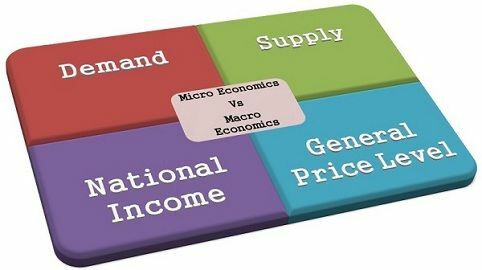 Microeconomics deals with an individual product, firm, household, industry, wages, prices, etc., while Macroeconomics deals with aggregates like national income, national output, price level, etc. Microeconomics covers issues like how the price of a particular commodity will affect its quantity demanded and quantity supplied and vice versa while Macroeconomics covers major issues of an economy like unemployment, monetary/ fiscal policies, poverty, international trade, etc. Microeconomics determine the price of a particular commodity along with the prices of complementary and the substitute goods, whereas the Macroeconomics is helpful in maintaining the general price level. While analysing any economy, micro economics takes a bottom-up approach, whereas the macroeconomics takes a top-down approach into consideration. It helps in the determination of prices of a particular product and also the prices of various factors of production, i.e. land, labour, capital, organisation and entrepreneur. It is based on a free enterprise economy, which means the enterprise is independent to take decisions. The assumption of full employment is completely unrealistic. It only analyses a small part of an economy while a bigger part is left untouched. It is helpful in determining the balance of payments along with the causes of deficit and surplus of it. It makes the decision regarding economic and fiscal policies and solves the issues of public finance. Its analysis says that the aggregates are homogeneous, but it is not so because sometimes they are heterogeneous. It covers only the aggregate variables which avoid the welfare of the individual. As microeconomics focuses on the allocation of limited resources among the individuals, the macro economics examines that how the distribution of limited resources is to be done among many people, so that it will make the best possible use of the scarce resources. As micro economics studies about the individual units, at the same time, macro economics studies about the aggregate variables. In this way, we can say that they are interdependent. Micro and Macro Economics are not contradictory in nature, in fact, they are complementary. As every coin has two aspects- micro and macroeconomics are also the two aspects of the same coin, where one’s demerit is others merit and in this way they cover the whole economy. The only important thing which makes them different is the area of application. Great thanks to all the concerned members of the same……I gain lots of knowledge through this article. I gain ample knowledge through this article. Thank you all, we really value your opinions. Now I can better explain anyone. Great knowledge shared. Thanks a lot! Nicely Explained as the majority of economic students gets confused between both the terms, but you have explained this topic very well. Thanks for sharing the article.